Don’t rack your brain over writing your online dating profile. • Truth or Dare & Can you count the F-Bombs? Did that just say PRO Online Dating Profile Writing Service? You dàmn skippy it did. You like women? Of course you do. Why the fùck else would you be here. Well, remember that game you played back in the day called Truth or Dare? Shìt – Who the fùck cares. You were only 15 and she was a cutie. Truth: Profiles with personality get more dates than boring carbon copy zombie drones. And a well written online dating profile is hands-down the best way to show off your somethin’ somethin’ that will make the ladies swoon. Because every single word is an opportunity. An opportunity to make the very first impression that’s perfect for you. And an opportunity to make her smile & want to scooch up a little closer to find out more aboutcha. An opportunity to show that you’re ALIVE. Most guys ruin this opportunity. They do what every other guy does online which is the worst possible thing you could do. Truth: You know you have to be different & stand out from all the other dudes online. But the word different seems to open up a black hole of writers block and transport all your creativity to the other side of the universe. It’s not about being unique. It’s about finding a unique way to tell your story. Well lucky for you, this is what I’m all about; distilling your details into morsels of undiluted impressiveness, perfectly honed to make cuties ache with that need to lick (I mean click). To chat & to meet-up. Because when you find a unique way to tell your story? You might still have competitors, but you’ll eliminate the competition. If you get a hangover – it could be worse, cause just remember that in 1976, Ronald Wayne sold his 10% stake in Apple for $800. Now it’s worth $58,065,210,000. Want me to write a profile for you – and set you approximately 17,233 light years ahead of your competition? (And all the boring eye-rolling put her to sleep profiles out there?) See below. I’m here to help. You get instant access to your personal profile writing dashboard. Fill in the short pre-session worksheet then email it to me, so I can start getting to know you, and begin meditating on your dating profile before we even talk. 15 minute phone call. Here’s the fun part of hopping on a call & discussing online dating. We’ll go over the questionnaire and I’ll ask a few questions to fill in the details. After our call, I’ll have all I need to capture your unique voice and start your profile. 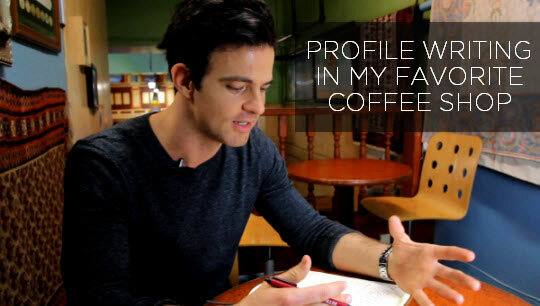 This is where the magic happens – I write your profile. I’ll head down to the coffee shop with my lucky pen & moleskin notebook. (seriously, that’s how I write.) Distilling your details into perfectly honed morsels of undiluted impressiveness ringing true to your unique voice. It’s still 100% you. If you’re not sure about something give me your feedback, because….. 1 round of profile tweaks is included. (This has never been used cause, well, my profiles always rock) Note that I won’t always accept your tweak requests without contest. If you ask for a change that I believe would be unwise, I’ll make a counter-recommendation, or try to understand the reasons behind your request to see if there’s a better way to implement it. I’ll take your feedback, make any revisions, and come back to you with a lightening bolt of a final draft.